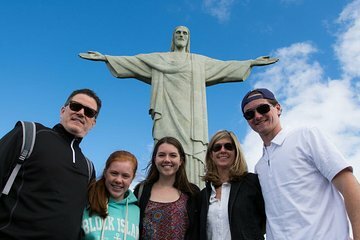 Visit Rio de Janeiro’s postcard landmark, the Christ the Redeemer statue, on this private, 4-hour photography tour. Along with a professional photographer guide, see one of the seven wonders of the world and an important symbol of the city. Cross Tijuca National Park by electric train to reach the top of Corcovado, where the beauty of this imposing monument can be best appreciated. The tour also provides one of the most beautiful views of Rio de Janeiro. Afterward, receive a high-resolution digital photo album and a printed souvenir photo. Hotel pickup/drop-off included. We love our pictures! Such a great tour if you want to remember Rio is a super special way. Renata is just the best. A really amazing experience.A big thanks goes to our photographer and superb guide Renata.She made our tour exceptional plus she is very knowledgeable about the history of Rio.We would recommend this tour very highly.Full marks in every way.Thanks so much from Malta.